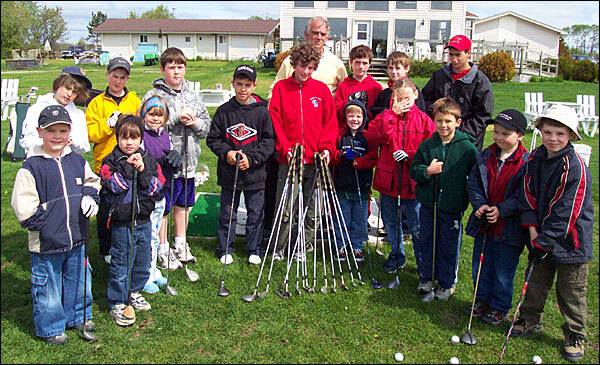 Vic Whissell is shown in the back of the group of junior golfers during one of his favourite lessons on the most effective use of your golf clubs. An avid promoter of Junior Golf development, Whissell will once again be running a ten-week Junior Golf League at the Whistling Winds Golf Course which is part of the Valley Family Golf Centre located on Regional Road 15, just outside of Blezard Valley. This year, he will be assisted by Carter McDavid, a 20-year old athlete from Valley East who is being coached by Whissell in preparation for his inaugural season with the golf team at Oakland City University in Southern Indiania. McDavid is on a double scholarship for golf and baseball. The Junior League begins on Thursday, June 22 and will run for ten weeks, every Thursday night beginning at 6:15 p.m. It will culminate in a year end tournament which will be held on Saturday, August 26, 2006. Boys and girls from as young as 4 years of age up to and including 16 are invited to register with the league for a fee of $65. This fee includes nine holes of golf every week; the year end tournament; prizes and awards; plus helpful instruction on how to play the game. Up to 72 participants will be accepted in the league. If you have a child who may be interested in registering for the Junior Golf League, give Vic Whissell a call at 897-7400. The cost is only $65 for ten weeks of play, plus a tournament on August 26, plus individual prizes and great instruction. You can’t beat it for value and your son or daughter will also have a chance to work with Carter McDavid and Vic Whissell. 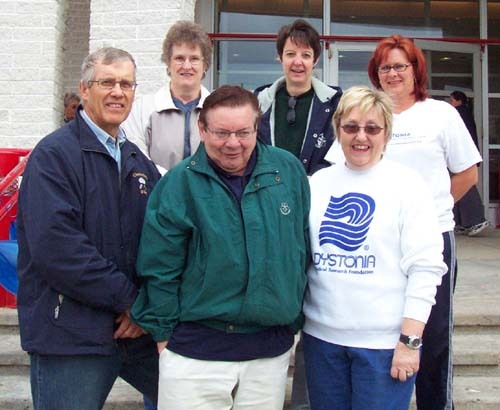 Every year, for the past nine (9) years, Mary Guy, shown on the far right in the front row, has worked tirelessly with many other volunteers to put on the Annual Dystonia Walk-And-Wheel to raise money for research and increase public awareness of this disease. The event took place at the Howard Armstrong Recreation Centre on Sunday, June 11, 2006 and was attended by a couple of dozen participants. Dystonia is the third most common neurological movement disorder, after Parkinson’s disease and tremors. It is characterized by involuntary muscle contractions that force parts of the body into abnormal and sometimes painful movements, according to The Dystonia Medical Research Foundation. There is no cure, only drug therapy, Botox injections and several types of surgery. Dystonia affects at least 20 people in the Sudbury area. Dwayne Backer, shown in the center of the front row, collected pledges totaling $1937.75. That, along with a donation by Wal-Mart to match the amount given by fellow employees of Dwayne’s will give him a grand total, and a new individual record of $2962.25. The whole group was expected to raise close to $8000 or more when all pledges are collected. Others in the photo included, from the left: back row: Nancy Kajdas, Shelley Martel, and Co-Co Lariviere. Len Shymkiw rounded out the front row on the far left. Shelley Martel, MPP for the Nickel Belt Riding, has supported and participated in some way in all nine of the annual events. Local merchants have always come through in fine style with donations of prizes and supplies for the barbeque and refreshments that follow the walk & wheel. 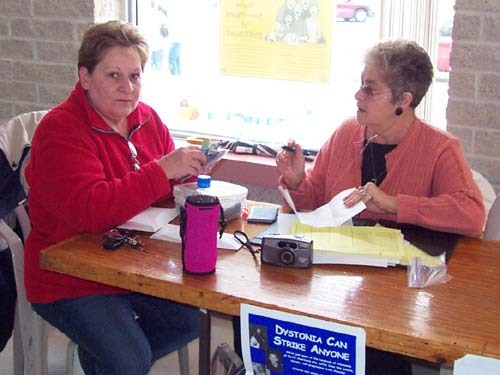 For Mary, herself a victim of Dystonia, it is always heartwarming to see that so many people care enough to help out with pledges and financial support. 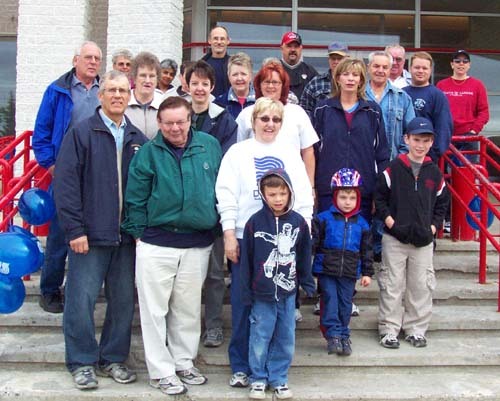 The photo on the left shows many of the participants in the walk who took a few moments to gather on the steps of the Howard Armstrong Recreation Centre before heading out. This group is not always large in size, but they certainly make up for their lack of numbers in the amount of money raised for this worthy cause. In the photo to the right, we see two of the volunteers who are taking care of registrations and tabulating the pledge totals. On the left is Lise Despatie and on the right is Angele Forest. 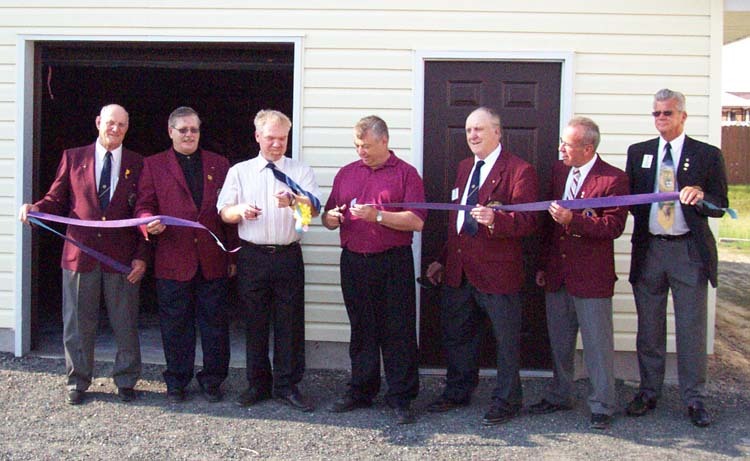 On Saturday June 17, 2006, the Valley East Lions' Club held a ribbon-cutting ceremony to officially open the storage building to complete the re-construction of the new Lions' Den which replaced the former structure which was destroyed by heavy snow several years ago. Doing the honours of cutting the ribbon were both Ward 3 Councillors, Andre Rivest and Ron Dupuis, who were instrumental in helping secure funding from the City of Greater Sudbury for this project. Others in the group included, from the left: Past District Governor, Roger Brideau; Incoming President, Doug Christink; Andre Rivest; Ron Dupuis; Past District Governor, Rolly Albert; Outgoing President, Roger Lariviere; and Past District Governor, Barry Brett. 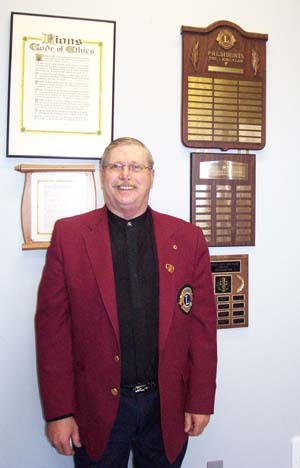 The Incoming President, Doug Cristink, shown on the left in front of the Past Presidents Plaque, takes up the leadership of the 41-member group for a one year term beginning on July 1, 2006. 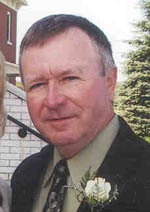 He will replace Roger Lariviere, who officiated at the Annual President's Appreciation Award Night held on June 17, 2006 at the Lion's Den. 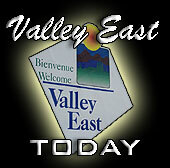 The Valley East Lions' Club has a proud tradition dating back to 1967 when Stan Boivin became the founding President. With a focus on Health & Welfare, the club has provided financial assistance and other support to countless groups, organizations and individuals over the years. 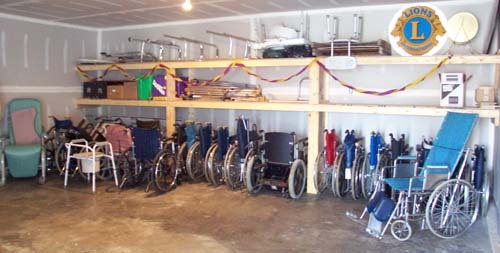 The new storage facility that was opened in the photo above will hold a large number of wheelchairs, walkers, crutches, and other medical equipment, including hospital beds which may be needed from time to time by local residents. The Lions loan out this equipment free of charge to anyone for as long as they need it. All you have to do is call the Lions Den at 969-4076 and leave a message. 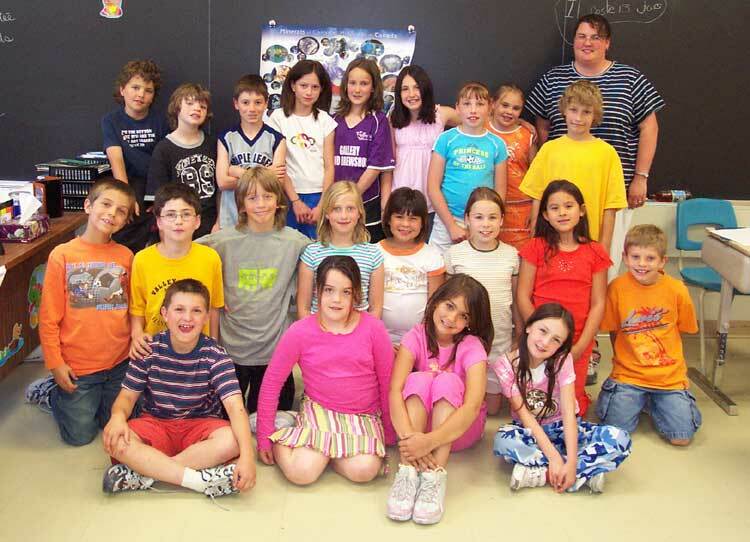 The smiling faces above belong to the Grade 3/4 Class at Hanmer's Ecole Notre Dame. Madam Lisa Charette, shown in the background, and the rest of the students were treated to a submarine lunch courtesy of the owners of the Hanmner Valley Shopping Centre, Val and Violet Mazzuca. This was their way of saying thanks to the school for participating in a special Mothers' Day Card display at the mall. The class was selected at random by the school principal. You can see the entire mall display by clicking here>>>>. The Valley East Youth Centre, located beside the Centennial Arena in Hanmer, will be re-opening with a new look and new equipment on Friday, July 5 at 6:00 p.m. Keep checking here for additional details on this exciting new chapter in the Valley East Youth Centre! [ Sudbury ]—After three weeks of building anticipation and three days of hearing Scriptural presentations at the 2006 “Deliverance at Hand!” District Convention of Jehovah’s Witnesses, those leaving the Sudbury Community Arena in Sudbury , Ontario were filled with joy. The public discourse “Deliverance by God’s Kingdom Is at Hand!” was presented on Sunday, emphasizing scriptures used by the Witnesses to prove that deliverance for mankind will not come from technology, political rulers, advanced education, or even the world’s religions. Witnesses feel that only Jehovah God can deliver mankind, using his Son, Christ Jesus, to destroy the wicked. They also feel that Christ Jesus is now ruling as the King of God’s Kingdom, a real government that millions pray for when they pray the Lord’s Prayer. The Witnesses were particularly delighted to welcome 19 who joined their ranks by getting baptized in an ordination ceremony on Saturday. Witnesses view baptism as one of God’s requirements for salvation. This is the time of year when I usually think about students graduating from school with plenty of hope for a great career and a lifetime of success. As we get older we continue to hold on to the hope that our journey of life will be filled with personal satisfaction and fulfilment. For most of us, life will in fact result in the achievement of all of our dreams, but these dreams may develop in ways that are hard to recognize. I thought about that when I met the beautiful lady shown in the photo below, named Therese Campeau. 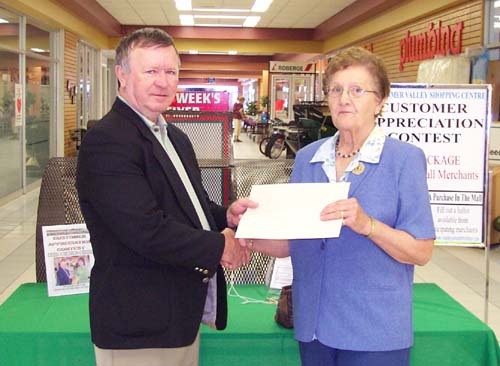 Therese and her daughter, Julie, had come to the Hanmer Valley Shopping Centre to pick up her prize package for winning the Customer Appreciation Contest for the month of May. During my conversation with her I discovered that she had lived her entire life in Hanmer. She and her husband, Rheal, enjoyed a marriage of over 51 years when he passed away in October of 2003. They raised five children, who all, amazingly, still live in Hanmer and are extremely close to their mother. She has 8 grandchildren and 2 great-grandchildren. My mind often works in mysterious ways, so I wasn’t the least bit surprised when I found my thoughts drifting to a story that I usually relate to graduates who are starting out on their journey through life. This time, however, the story really seemed to tell me a lot about Therese, the life she has enjoyed and the dreams that have come true for her. After a few years of praying that their dreams would come true, a group of woodsmen came upon the trees. When one came to the first tree he said, “This looks like a strong tree. I think I should be able to sell the wood to a carpenter.” As he began cutting it down, the tree was happy because he knew that the carpenter would make him into a treasure chest like he always wanted. At the second tree a woodsman said, “This looks like a strong tree. I should be able to sell it to the shipyard.” The second tree was happy because he knew he was on his way to becoming a mighty ship. When the woodsmen came upon the third tree, the tree was frightened because he knew that if they cut him down his dreams would not come true. It would not be able to continue to grow tall and strong, One of the woodsmen said, “I don’t need anything at all from my tree so I’ll take this one.” And he cut it down into large pieces and left it alone in the dark. The years went by, and third tree forgot about its dreams. That morning, I felt as if I was the one receiving the prize. Thank you Therese, and may you continue to enjoy your “prize” for many years to come. The next municipal election for the City of Greater Sudbury will take place on Tuesday, November 13, 2006. A lot of things happen during a four-year term. Some are good and some are bad. However, every decision that is made by our municipal council has a direct impact on the lives of people living in Valley East and Capreol. Please note that Candidates have until 5:00 p.m. on September 29, 2006 to file their completed nomination form. It hoped that anyone who is serious about standing for election will declare his/her intention as soon as possible so that we have enough time to fully understand their individual platforms.